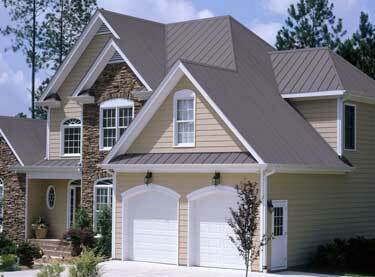 What are the benefits of Steel Metal Roofing? That`s because asphalt roofing, being made of oil impregnated paper or fiberglass, begins to deteriorate as soon as you put it on your roof. Just normal weather and the sun`s ultraviolet (U.V.) rays add to an asphalt roof`s deterioration. A metal roof, however, will not decompose. And unlike asphalt and other roofing styles, a metal roof can withstand just about everything Mother Nature throws at it. Other roofing materials such as wood shingles and tile have varying degrees of weather related problems also. Wood shingles dry out, cracking and curling over a relativelyn short period of time. Recent wood shingle and shake roofs have needed replacement before twenty (20). Concrete tile roofs have experienced problems with freeze/thaw cycles, especially in northern climates. Metal roofing that retains its good looks, whether it is shake, tile or vertical seam panels, outlasts both of these products.